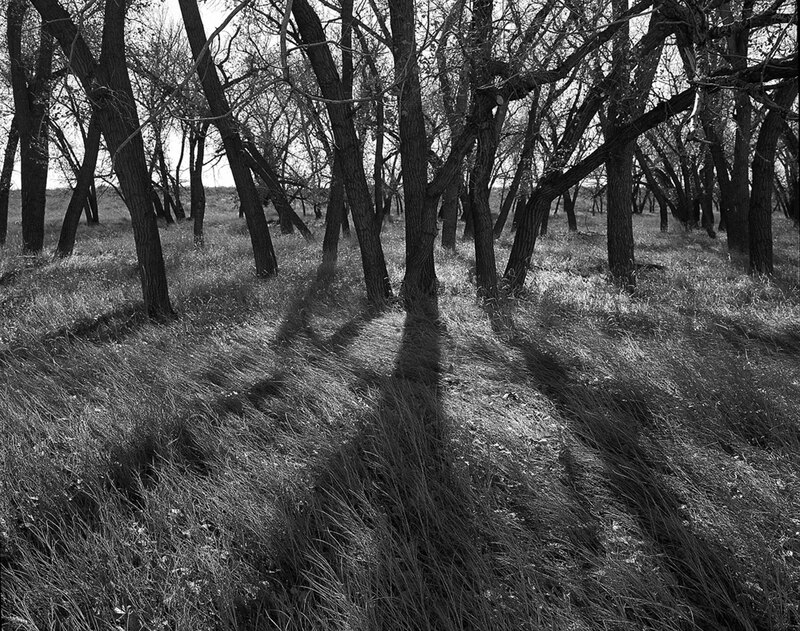 This is a photograph of grove of Cottonwood trees, which I took in memory of the Sandcreek Massacre, where an encampment of peaceful Cheyenne and Arapaho were attacked and slaughtered by a Colorado militia under the command of John Chivington in November of 1864. The Indian village, under the leadership of Black Kettle, had been told to camp along Sand Creek in eastern Colorado in order to receive protection from the United States army. But Chivington’s militia was a drunken ramble of the home guard during the Civil War, and was determined to kill as many Indians as they could. Before the attack, two officers, seeing that the village was flying a US flag and was mostly women and children, held back their men. Afterwards, when controversy swirled around the events of the attack, both of these officers were murdered so that they could not testify at a formal inquiry. Today, the wide-open prairie outside of Eads, Colorado, has been purchased by the Federal Government and the site is now a small National Park. Every Thanksgiving a group of Cheyenne and Arapaho youth organize a run to Denver, about 170 miles away. I never know what I am going to find, or what I should look for, when I visit these memorial sites. Across from the Park is a small railroad crossing, and when I was there, in 2009, it was still marked “Chivington”, named after the man who led the attack. That can be the difference between being a writer and a photographer. While I thought that sign was fascinating, it did not really make a photograph. Sometimes when I look at trees, especially old ones, I think, what have you seen? What secrets could you tell? But they never do.